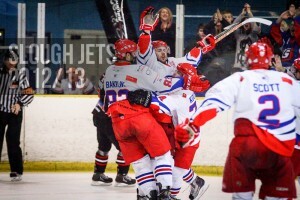 Slough’s final of three games this week saw the Jets back on home ice to take on the Swindon Wildcats. Floyd Taylor scored the opening goal of the game when he beat the home team netmidner at 6.46 but Matt Towalski levelled the game at 13.18 finishing a pass from Mindy Kieras. At 15.40 Darius Pliskauskas completed from Lee Richardson for the game winning goal, giving Slough a lead they were never in danger of losing. 3.19 into the second period Dan Davies made it 3-1 with a powerplay strike which provoked the visiting coach to call his time out. The remainder of the middle period passed by scoreless but the home team held a good 3-1 lead by the second interval. Slough took full control of the game in the final period with Alan Lack netting his first goal for the club at 46.04 finishing from Towalski and the assister became the scorer at 49.00 to make it 5-1. Ciaran Long scored the sixth at 52.20 and with 1.15 left Pliskauskas netted his second of the night to complete the scoring at 7-1 and earn the two points in a good offensive, defensive and netminding display. Slough returned to their home ice to host the second of the weekend fixtures against the Basingstoke Bison. Neither team gave an inch at the start of the game, just as they had the previous night but this time the opening goal came within the first 20 minutes when Greg Owen netted a powerplay strike at 16.25 with Adam Greener sitting out a slashing minor. The middle period saw 18 shots on goal combined between the teams but saw no further scoring setting up a tense final period. Slough’s equalising goal came with a delayed penalty goal from defenceman Tomas Valecko who scored at 43.00 and as the teams traded penalties the clock ticked down with neither team managing to find the game winning goal in regulation time. Overtime also passed scoreless, mostly played 4 on 4 but the final 1.45 played 3 on 3 as Bakrlik and Cesky both served minor penalties. Penalty shots decided the result after Darius Pliskauskas missed, Greg Chambers scored. Frankie Bakrlik opened the second round of shots with a goal past Steve Lyle but Jaroslav Cesky also scored meaning that Valecko’s penalty shot miss ended the game in favour of the visitors. Slough Jets travelled to Peterborough with both teams looking for a four point weekend. The visitors fell foul of the referee and concede an early powerplay goal to Peterborough at 1.53 when Luke Ferrara netted but Adam Calder finished from Dan Davies at 7.00 with a shorthanded goal to level the game. The pair then reversed with Davies finishing from Calder at 13.47 for a second shorthanded goal before Jeff Glowa levelled at 2-2 with a powerplay goal at 14.44. Slough then netted the first even strength goal of the goal at 16.29 when Sam Waller scored his first point of the season. Calder netted a second at 19.59, just ahead of the buzzer to end the first period 2-4. Peterborough then scored their last two goals of the game with powerplay strikes at 22.36 and 23.29 from Ziedins to level at 4-4 but Slough then turned up a level starting with a powerplay goal from Tom Carlon at 24.15, followed by an even strength goal from Joe Greener unassisted at 28.01 and Calder finished his hat-trick at 38.41 to end the second period 4-7. There was no scoring in the first ten minutes of the final period but Darius Pliskauskas scored the visitor’s 8th at 50.01 and opened the floodgates again. Slough closed in on double figures with a powerplay goal from Terry Miles at 55.16 and a second strike from Waller in his first weekend with Slough completed the double figures score for the visitors. Third placed Slough Jets made the short journey across Berkshire to face the ninth placed Bracknell Bees. Nigel Boniface took charge and Slough took the lead with just 19 seconds of play when Doug Sheppard scored on Carl Ambler. 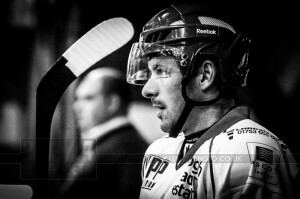 Former Slough player Terry Miles levelled the game with a goal for Bracknell at 8.16 and the teams ended the first period level. Slough sealed their win with their middle period. Bracknell converted a Koulikov penalty into a powerplay goal at 20.48 through another former Slough player, Nicky Watt but Adam Greener scored for Slough against his former club at 23.30 to level. Joe Greener was next to net for Slough to give them back the lead at 24.23 and Darius Pliskauskas scored at 25.18 to make it 2-4. After a goal fest at the start of the period the goals fizzled out and then period ended 2-4. After defeat at home to Sheffield Slough took to the road hoping to get back to winning ways at Rom Valley Way. Neither team could take a grip on the game early on and the only happening in the first period was Romford’s two minute penalty which Slough failed to capitalise on. The second period saw Slough up their game but again failing to break the deadlock. This period saw both teams with powerplay opportunities but again neither could score. The goals finally started coming in the final period as again Slough dominated shooting. Peter Poljacek netted first for the visitors at 41.12 and Carl Thompson followed at 42.26. Romford failed to lie down and Jesse Hammill scored at 46.24 and Danny Marshall equalised at 53.59. Slough finally finished off the game with Peter Jasik getting the game winning goal at 55.44 and Michael Bowman adding a safety goal with 1.41 left.